Pro Mailing Equipment offers many off-line or in-line Production tabbers for every type of direct mail, marketing and general mail application need. Reconditioned, used tabbers and folders are available to suit any budget. 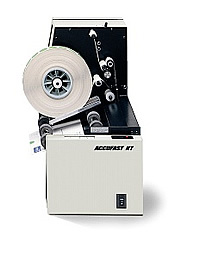 Featuring Accufast tabbers, we have the right mailing equipment for any sized business application. Is your company looking for application consulting? Call us - we offer business consulting services for your specific requirements. Are you seeking to automate your mail operation? Folding and stuffing taking too much time? We can assist. Accufast automatic label affixers are the practical way to apply pressure sensitive labels automatically, eliminating the tedious, labor-intensive and manual "peeling and sticking" process. You'll appreciate the way tabbers, folders and other professional mailing equipment boost office productivity, get your mailings out on time, and free your staff to do more important jobs. To meet USPS automation rate discounts, certain mail pieces need to be tabbed prior to delivery to the Post Office. Secap tabbers offer a simple, fast solution. 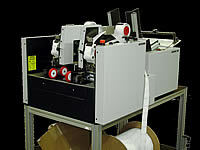 Choose from the 1020 in-line/off-line tabber or the 1012 heavy-duty tabber/labeler. Call us for information on other makes and models off-line or in-line Production tabbers for your application. 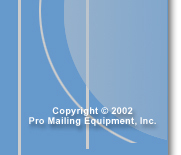 Pro Mailing Equipment offers new, rebuilt and used / pre-owned tabbers to companies nationwide. We look forward to serving you. Meet all your requirements for tabbing, labeling, stamping and decal affixing with the floor model Secap Jet 1 Tabber. Easy to set up and operate in-line or off-line offering the highest productivity for today's mailing professionals. Its superb design and engineering combined with Secap USA's first class support insures your company years of reliable production. Click here for more information. Jet 1 Dual Tabber places toe and heel tab placement for booklet mail in a single pass. The T-2000 is a high performance tabber, applying up to 3 tabs at speeds of up to 20,000 pieces per hour. The 1030 Tabber provides an affordable tabbing solution. The Secap 1030 Tabber is a compact, tab and wafer seal applicator that automatically applies adhesive tabs on open-ended mail. Click here for more information. 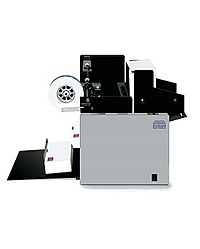 The 1012 Tabber and Label Affixer is a fast, off-line tabletop unit that applies tabs/wafer seals at productions speeds. Click here for more information. The 2020 Dual Tabber easily applies one or two tabs in a single pass. Heavy-duty construction, precision feeding and accurate tab application all at production speeds up to 21,000 pieces per hour. Click here for more information. The W360 is a heavy duty dual head tabber can apply tabs to multiple sides of a mail piece in one pass. We also offer reconditioned / rebuilt / used tabbers - see our Reconditioned Equipment page for information. 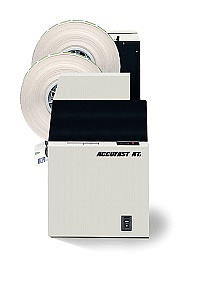 The ACCUFAST ET is the next generation of table top tabber. The ET is designed to handle everything a mailer throws at it, from edge tabbing or top tabbing of self mailers to the specialty tabs needed to meet booklet requirements. 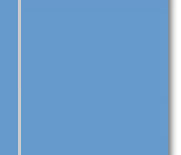 Different formats are selected with the twist of a knob and tabs are automatically placed per the USPS specifications. The ET is simple to use and more versatile than any tabber in its class. Click Here for more information. 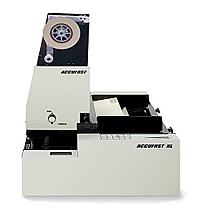 The ACCUFAST KT has been characterized as the best table top tabber ever made. Nice to hear and well deserved. Now, it applies either 1 inch or 1.5 inch tabs at speeds of 15,000 per hour. The KT is a crash tabber module. It must be used with a feeder and depending on the application a number of feeding devices are available. The KT is the basis of a simple professional level tabbing system. Combine it with an FX feeder and a CS3 output conveyor to create a simple tabbing system. Both units are known as crash tabbers in which the edge of the piece to be tabbed is fed into the machine first. That edge contacts the tab which has fed down in front of the piece, pulling the tab from its backing paper. The tab and the piece then crash into a sweep and roller system that folds the tab neatly and tightly to the piece. The KT2 can be characterized as the KT's big brother. It takes care of the twin tab requirement on thin forms in a single pass. Each head works independently of the other as they apply tabs to the lead edge of the piece as it moves through the machine. The KT2 is also often the basis of a tabbing system. The Freehand Tabber is a simple single tab unit with a built in feeder. This machine uses crash tab technology in which a tab is ejected in front of a piece and the piece crashes into it carrying the tab and the piece between a set of rollers where the tab is folded and sealed. The base unit is the XL with a Stamp Kit. If you are occasionally running stamps, this is the way to go. Typically, customers buy the stamp kit as an add - on and install it in the field. Strictly for stamps and roll diameters in the 6 inch range. The XL/R is available as a factory purchase or as a field upgrade. It uses the stock XL transport, but has a heavy duty roll labeling head instead of a fan fold tray. The roll head accepts rolls of stock up to 3 inches wide and 10 inches in diameter. This set up is recommended when a variety of roll label jobs are being done. The XL/R does stamps and much more. The VL is used in line with inserters or with a feeder to apply stamps or tabs. It is wide and strong enough to handle RPN's in 12 inch rolls. It features a heavy duty transport with a sliding head to allow for maximum flexibility and strength. It's modular design and flat transport table mounted on an adjustable height stand makes it an ideal inserter add -on unit.